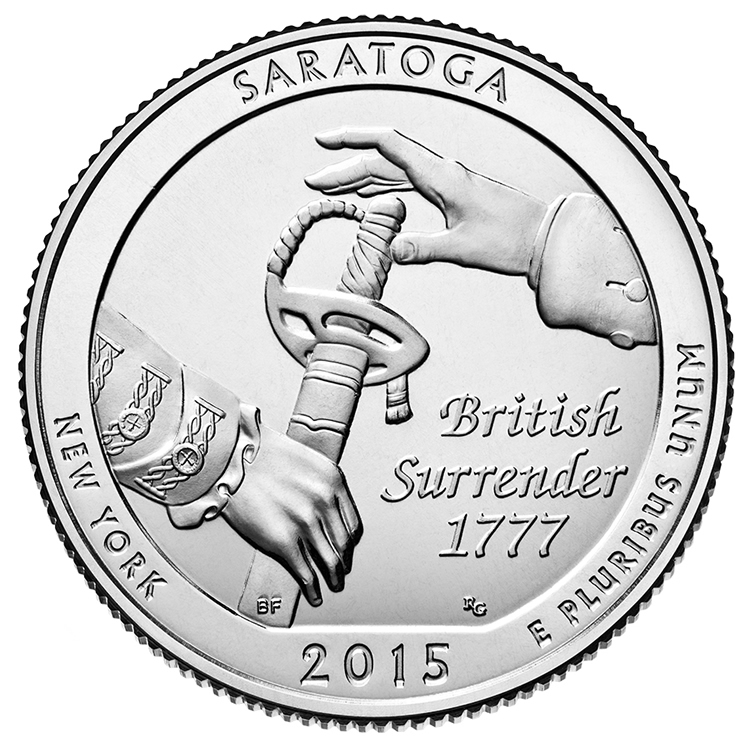 With this year drawing nearer to a close, interest in 2015 coin releases becomes more apparent. That is especially true for year-specific issues such as the 2015 America the Beautiful Quarters which honor national sites in Nebraska, Louisiana, North Carolina, Delaware and New York. 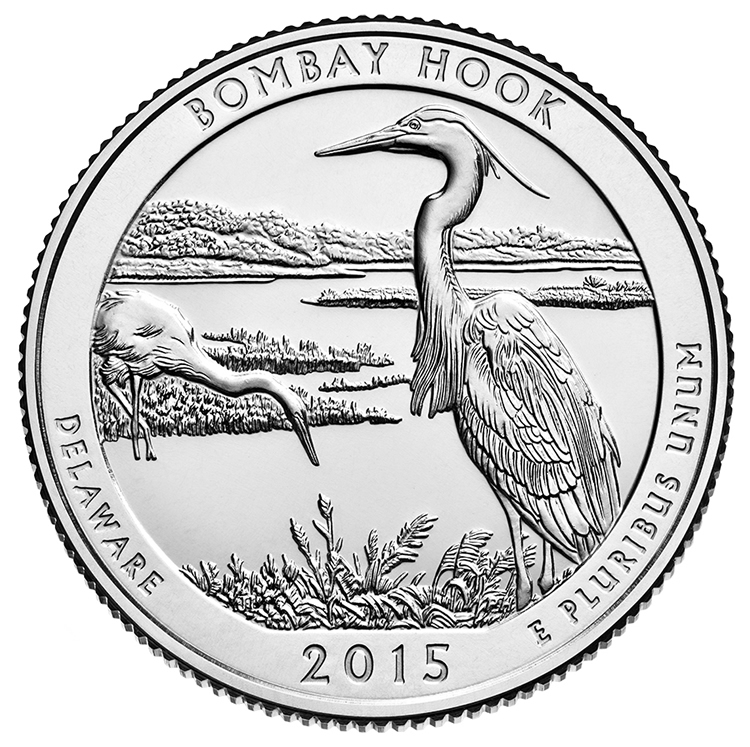 To help familiarize everyone with the new quarters, high-resolution images are now available. The scheduled circulation release dates for the coins are also known. Both are offered further below. But first, a primer for those who have not followed the series… The America the Beautiful Quarters® Program debuted in 2010 and features five releases annually. Each honor a different site of national interest with one selected from each state, the District of Columbia and the five U.S. territories. In addition to the quarters themselves, the same imagery is found annually on two associated U.S. Mint programs including the three-inch America the Beautiful Five Ounce Silver Bullion Coins and companion America the Beautiful Five Ounce Silver Uncirculated Coins. When a specific quarter is released into circulation via the Federal Reserve Bank system, rolls and bags of the coins also typically become available from the United States Mint. A corresponding official launch ceremony is also held near or in the honored site. Following a design selection process which involved multiple artists, officials of the sites and host jurisdictions, U.S. Mint personnel and review by two independent bodies, a final design for each honored site is selected by the Secretary of the Treasury. These designs were unveiled through line-art imagery earlier this year. Now, however, we have high-resolution images of actual 2015 America the Beautiful Quarters in uncirculated quality. They are shown below along with a brief description of each design. 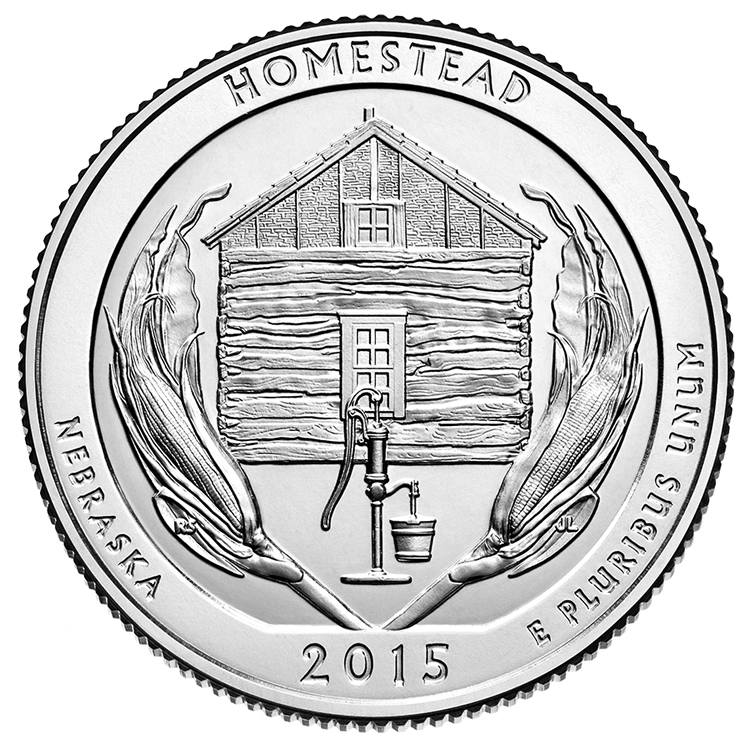 U.S. Mint Artistic Infusion Program (AIP) artist Ronald D. Sanders designed the reverse of the Homestead National Monument of America Quarter to represent three survival fundamentals common to homesteaders: food, shelter, and water. 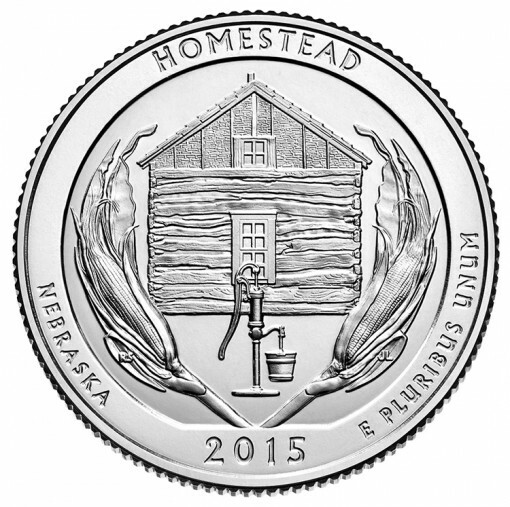 The image depicts corn stalks, a log home, and outdoor water pump along with the inscriptions of HOMESTEAD, NEBRASKA, 2015, and E PLURIBUS UNUM. U.S. Mint Sculptor-Engraver Jim Licaretz was in charge of sculpting. 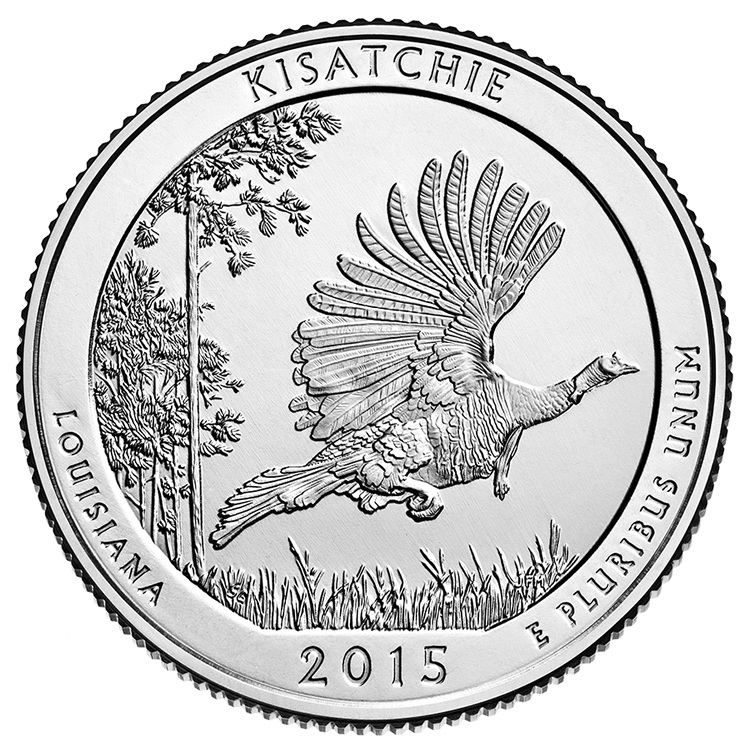 A wild turkey flying over blue stem grass is seen on the reverse of the Kisatchie National Forest Quarter. The image by AIP artist Susan Gamble also includes long leaf pine trees in the background. 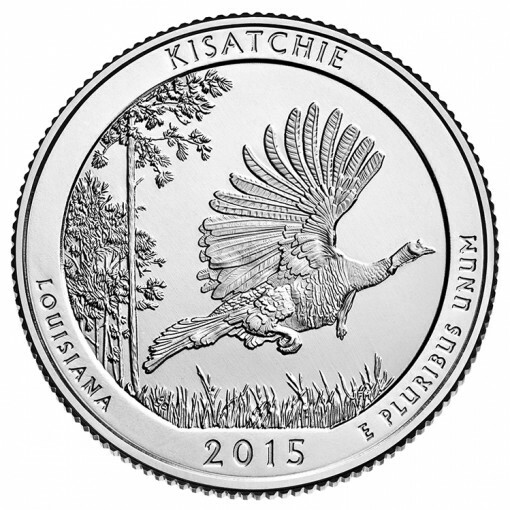 KISATCHIE, LOUISIANA, 2015, and E PLURIBUS UNUM inscriptions complete the design which was sculpted by United States Mint Sculptor-Engraver Joseph Menna. 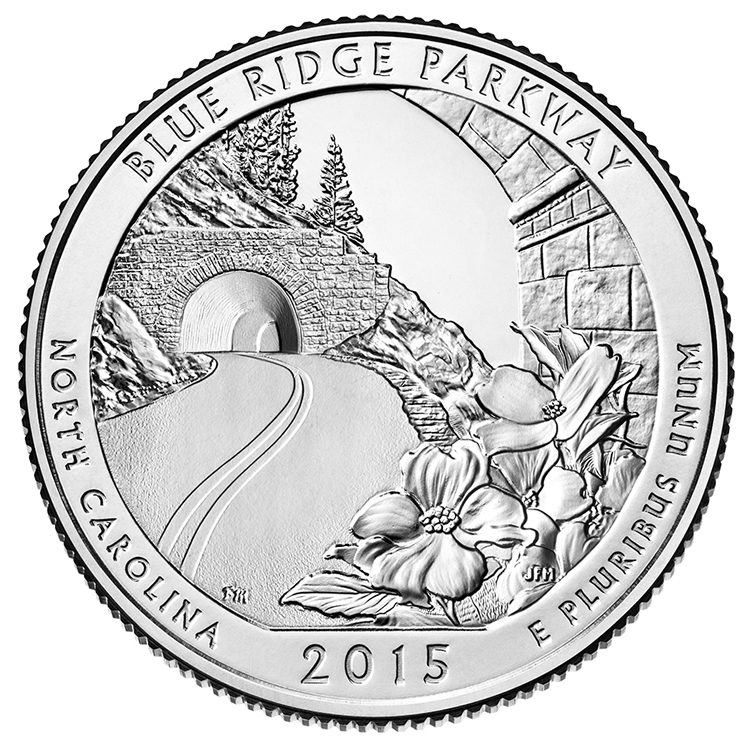 The Blue Ridge Parkway Quarter offers a reverse design depicting a curved road hugging the side of a mountain as it enters a tunnel. North Carolina’s state flower (Cornus florida) can be seen in the foreground. Inscriptions include BLUE RIDGE PARKWAY, NORTH CAROLINA, 2015, and E PLURIBUS UNUM. The image was designed by AIP artist Frank Morris with sculpting by U.S. Mint Sculptor-Engraver Joseph Menna. A great blue heron is seen in the foreground of the Bombay Hook National Wildlife Refuge Quarter with a great egret in the background. Both are set against the Refuge’s tidal salt marsh. BOMBAY HOOK, DELAWARE, 2015, and E PLURIBUS UNUM are offered as the reverse inscriptions. AIP artist Joel Iskowitz designed the reverse with U.S. Mint Sculptor-Engraver Phebe Hemphill sculpting. 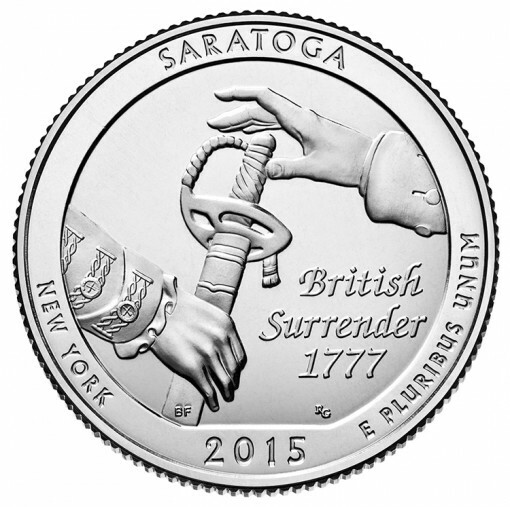 A surrendering of British General John Burgoyne’s sword to American General Horatio Gates is shown on the Saratoga National Historical Park Quarter. The pivotal moment of the American Revolutionary War includes the inscription of BRITISH SURRENDER 1777 and is surrounded by additional inscriptions of SARATOGA, NEW YORK, 2015, and E PLURIBUS UNUM. The image was designed by AIP artist Barbara Fox with U.S. Mint Sculptor-Engraver Renata Gordon sculpting. To keep apprised of past and current releases, visit this site’s section of news about America the Beautiful Quarters. Still waiting for a sale date for the 2014 Limited Edition Silver Proof Set. Jim, I think us mint wants to sell as many silver proof Eagles and silver proof sets as possible before this year ends and offer limited set in January. Aren’t limited sets cheaper? I wouldn’t think so. I believe it’s just a repackaging of already issued coins and they usually charge more for that. I’m not sure the mint is allowed to issue new coins after the year of their date which leaves the mint less than a week to make this announcement. Selling coins after their issue year apparently is allowed (which I personally disagree with). Yes, the Mint selling products the calendar year afterward makes no financial sense – it is the same as them saying that they know their products are of no value and they are begging you to buy them. It is BAD business. They need to sell products only in the same calendar year, and having lower, random mintages would certainly help. Imagine one year the Mint Proof Set sells out in March after only 144,311 units made! WOW! I think it’s more a reflection of bad management at the mint (aka Dep Dir Peterson) to produce quantities beyond demand. I wouldn’t stop sales of a popular beginners set in March but I would announce a last sale date for such favorites and let the mintages be determined by close of business on that date. In fact I think the mint should announce last sale dates for all items that don’t have mintage limits. And keep a sales counter for each product on the website so that people can tell how close a product is to a sell out. But surprise sellouts? I think that would be a mistake especially considering those who have to budget their purchases over time where knowing the deadline date would be helpful. Only 7 more years to complete my collection. Have a Healthy Happy Prosperous 2015 and collect selectively. Remember it’s Congress that decides the quantities of commemoratives, not the mint. And Congress isn’t interested in coin collectors but rather in raising the max they can for their favorite charity that the surcharges are given to. At least the law boilerplate always limits sales to the year of issue. Good luck with bullion coins, the government always favors commerce. We have a 2015 Nebraska misprint where the line goes through the whole 2015 year….has anyone else seen this? I got the kisatchie and the circle on the back is also on the face. It feels light so either it had to much pressure and started to come through on the front or it somehow flipped and got the front. Any idea?? I have one made in New York… Are they valuable?